Your city should begin to speculate about driverless cars and city planning. We did choose our words carefully because obviously no one can predict exactly how self-driving, autonomous vehicles will impact the design and functioning of our cities and towns. In this article we try to refrain from “gee whiz” kinds of observations about the technology, choosing instead to help you think about the site plan review, subdivision regulation, and zoning ordinance provisions that may be appropriate and necessary to take advantage of a potential large-scale revolution in our approach to personal transportation and over-the-road movement of goods. In short we think that driverless cars will potentially allow narrower streets, less public parking, faster turnover of on-street parking, increased safety, and possible reduction of greenhouse gas emissions, costs of travel, and congestion. Their potential to increase mobility for seniors, children, and the disabled could bring large social benefits. Widespread deployment of driverless cars, also called robot cars, could help people get to transit lines efficiently and thereby increase ridership. But people also might choose to take the autonomous vehicle (AV) direct to their destination. From our perspective, we think that the positive relationships between driverless cars and city planning will only be realized if most of the AV adoption takes the form of shared-use vehicles. Of course, we haven't had much success in America in convincing people to share their vehicles in the form of carpooling or van pooling, so clearly some different incentives will have to be put in place if your city and neighborhood are to benefit. On the other hand, if autonomous vehicle rollout is managed poorly in your city, costs and congestion could actually increase, and the gap between rich and poor in terms of transportation cost and availability could actually widen. If people use driverless cars instead of bicycles or walking, the positive health effects of increased use of this active transportation over the last few years will disappear. If people choose to be lazy physically, the end result could be fewer pedestrian amenities as people choose to use inexpensive ride hailing autonomous vehicles for short trips instead of walking. Yet another consideration for those who ponder the relationships between driverless cars and city planning is the major loss of jobs that will occur as people who drive for a living, including truck, taxi, bus, and school bus drivers, are displaced. Today's auto mechanics will be challenged to increase their technology savvy rapidly, or risk also being displaced. Lastly, sprawl is likely to increase unless offsetting policies are initiated. The truth is that driverless car technology is moving along faster than many commentators had predicted. All the major manufacturers of U.S. automobiles and a number of technology companies are testing experimental models. Although our article may seem premature because there are many unknowns, we think it's time for local communities to start being serious about keeping up with the technology and new transportation business models. The International Society of Automotive Engineers has defined six levels of automation, from "none" up to fully autonomous vehicles not requiring any human to be present. All of this makes the exact pathway for the next couple of decades confusing, but planning commissioners and elected officials should be thinking through some possible scenarios and starting to develop criteria for reimagined streets, public spaces, infrastructure, and parking. Just to clarify our terms, we need to point out to those who haven’t thought much about this subject that driverless cars in and of themselves conceivably might not change too much about city planning and community development. But this technology is not developing in a vacuum. Let's dig deeper. First of all, the need to make self-driving cars safe will only accelerate the already underway push for manufacturers to develop what is known as V2V (vehicle to vehicle) communication methods aimed at preventing accidents. Vehicle-to-vehicle is highly anticipated due to a probable increase in safety at a fairly minor expense to private automobile purchasers. This technology family probably will be required within a few years for new cars manufactured in the U.S.
At the same time, manufacturers are working with transportation engineers to develop V2I (vehicle to infrastructure) communication that allows the vehicle to interact with traffic signals, sensors that detect traffic congestion and enable re-routing of the autonomous vehicle, or other elements of infrastructure. Both V2V and V2I exist now, even though deployment is limited. To further set the table for our thinking about driverless cars and city planning, most companies and individuals are conceiving of the driverless car as an electric vehicle. This implies that planning for sufficient charging stations will play an important role in how driverless cars and city planning interact. Experts also predict that because this technology is occurring simultaneously with the rapid rise in popularity of ride hailing services, such as Uber and Lyft, driverless cars actually may not be privately owned and might instead be owned by the ride hailing companies, transit agencies, cities, or non-profits. Just to put in place a final piece of jargon that you will hear if your city or neighborhood explores this territory, in our imaginary situation, there is widespread buy-in and action on the idea of TaaS (Transportation as a Service) as opposed to private vehicle ownership. Yet another aspect of this picture is that currently we expect that driverless cars will be able to platoon safely; that is, they could be physically or digitally attached together to travel as a convoy or a caravan. This would require far less space between vehicles, especially when teamed up with V2I to synchronize this platoon’s movement through traffic signals without disruption to intersections. 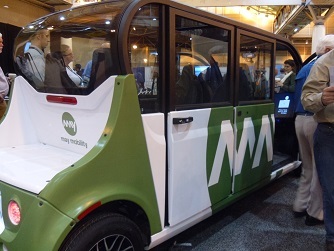 So now we have built a picture of a driverless electric vehicle, equipped with V2V and V2I communication technologies, and usually owned by a company, transit agency, or non-profit that allows many individuals and households to be transported without household-level ownership of the vehicle. At first, models including new shuttle services aimed at recurring trips to school or work, ride hailing as now practiced, and new subscription services are likely to predominate. Shuttle services may begin with a fixed route along major corridors and then progress to more sophisticated routes as data sharing collects precise origin and destination information about residents' and visitors' trips. Now we can think in more specific terms about what driverless cars might mean for the ordinary standards, requirements, best practices, and plan documents that are common in city planning. We think the most obvious impacts are on road and street width. Transportation engineers have estimated that autonomous vehicles can double the capacity of a freeway. We aren't aware of any study that is specific to city streets, but we are predicting the impact could be similarly large. Each lane can carry much more traffic, due to the reduced safe gap between vehicles, elimination of hesitancy on the part of slow drivers or drivers looking for a street sign or address, and increased capacity of the street due to the elimination or reduction of unnecessary traffic signal stops. This means that in some instances, a four-lane street can be reduced to two lanes. Due to greatly reduced driver error, the lanes themselves also may be more narrow, perhaps reduced to 8 or 9 feet wide. So suddenly instead of a 40 foot width to accommodate four lanes, we might have a 16 or 18 foot width for two lanes. We're not considering turning lanes to keep it simple, but those too might be eliminated because a traffic gap to allow a turn can be created when one is needed. We even have seen some discussion of designing residential streets to be only one lane wide, with traffic moving in either direction needed. With automated controls, this would be a safe proposition and would allow neighbors to be closer to one another, increasing neighborly behavior and facilitating neighborhood watch types of anti-crime activities. Yes, some people call our bi-directional turning lanes the suicide lane now, but all in all, we manage; when there is an accident there, it is usually because of driver inattention or impatience, both of which presumably are eliminated with driverless cars. For planners, planning commissions, and city councils, this may create a new opportunity for a number of road diets in which existing streets and roads suddenly have the space to accommodate street trees, new or wider sidewalks, new or more generous bicycle lanes, new landscaped public spaces with attractive streetscape, or capacity to vacate part of the street to allow it to revert back to private property for adjacent businesses or residences. In the early stages of adoption, when only major corridors are impacted, this may amount to creating some new parklets and leaving more permanent decisions until a later date. Of course, the flip side is that in some locations, private property interests will clamor for public right-of-way to be vacated in order that adjacent property owners add to their lawns. New developments will be able to devote more space to the primary land use, helping to keep street construction and therefore housing costs lower. The second most important relationship between driverless cars and city planning will be in the area of parking needs. The extent to which parking requirements can be lowered depends on how much adoption of TaaS occurs within the same timeframe as driverless car adoption. With just a little imagination we can see that a ride hailing driverless vehicle will not need to be parked nearly as often as a private vehicle, because the self-driving car will be on the road much more. So parking lots and parking garages as such will be in much less demand. Some of those spaces can be converted into alternate land uses, greatly improving both the appearance and the functioning of our downtowns. Even necessary parking for autonomous vehicles can be located on the perimeter of busy areas, freeing up prime real estate for redevelopment or engaging public spaces. It's true that an agency or entrepreneur owning a fleet of autonomous electric vehicles will need to be able to park them long enough to charge them, and it's also true that in the middle of the night parking need will be much greater than at rush hour. However, consider that parking spaces also could be more narrow and parking aisles reduced in width. So be wary of exaggerated claims that one of the city planning impacts of driverless cars will be that little to no parking will be needed. Current city planning requirements for two or more parking spaces per single family dwelling might begin to look obsolete as well. Multi-family housing can really benefit from reduced parking minimums. Many pundits think that since autonomous vehicles can park themselves at a remote location, passengers will demand to be dropped off as close to workplaces and popular destinations. Managing curb space will become a major issue as driverless cars and city planning impact one another. Designing drop-off zones that don't interrupt bicycle and pedestrian flow will be a new challenge that will need to be accommodated in the space now devoted to on-street parking. So our opinion is that on-street parking area can be substantially reduced, but that some of the savings will be eaten up by the new demand for drop-off and pick-up areas. While there is plenty for planning-oriented citizens to like about driverless cars, there are some down sides too. Chief among these may be the tendency for folks to choose to live ever further from their jobs, recreation, and shopping. Since commuting time can be spent reading, working, talking on the phone and texting (just like now! ), sleeping, or talking with spouses, colleagues or those with whom a ride is being shared, the felt costs of commuting may be considerably reduced. This may aggravate the tendency to think that commuting 50 miles in a hailed autonomous vehicle is just as easy as commuting 20 miles as a driver. So we will be writing separately about driverless cars and sprawl in the next few weeks. Another consideration is the significant cost of converting public streets and traffic signals to be AV-friendly. Retrofitting of traffic signals will be necessary to allow for continuous traffic until a V2I message "tells" the traffic signal that a stop signal is needed. This retrofit can fulfill multiple purposes also, such as allowing cameras, broadband signals, and other data collection and dissemination tools to be mounted on the traffic signal standard. In addition, lanes will need to be reconfigured to stripe drop-off areas clearly, possibly eliminate turning lanes, and narrow existing lanes. In the transition period when both autonomous and non-autonomous vehicles share the road, dedicated autonomous lanes probably will need to be created. Sensors will need to be installed in the roadway itself as well. These are non-trivial expenses for the public sector. Arthur Nelson has guesstimated that these costs may be up to $2 trillion in the U.S. Obviously this type of capital expenditure will reshape capital improvement plans and municipal budgets. The need for explicit and early definition of who is responsible for managing which aspects of the emerging autonomous vehicle system, with appropriate and democratically determined division of duties and privacy responsibilities among the public sector, residents, and private companies that may or may not receive an official franchise or license from states or cities for operating shared-use and shuttle services, and for parking and recharging on public property. What can interfere with this mostly rosy scenario? We see plenty of potential driverless cars and city planning problems ahead, with the chief one being a very tricky transitional period during which driven cars without V2V or V2I technology are mingled on the same road or street with autonomous vehicles well equipped with sensors and communication devices, all of which aim to maximize traffic speed, efficiency, and safety. Working that out on a national and local level will keep manufacturers, legislators, and many transportation engineers occupied and intense transportation planning on the agenda of metropolitan planning agencies. The best thinking we have seen so far on how the transition period will work is that perhaps there will be a designated lane on major roadways where the driverless cars can platoon and operate under their own norms. Driverless car technology thus far appears not to be able to discriminate well between objects in the form of other vehicles, pedestrians, or large debris and the lightweight items such as empty plastic bags or the paper cup thrown out the window. While human drivers would not slam on the brakes for the plastic bag or cup, the driverless vehicle may suddenly stop, causing the driven car behind it to crash into the autonomous vehicle. Simple scenarios such as this one are causing experts to predict the interim solution of separated lanes. This and many other problems are likely to occur while the technology learns to apply algorithms similar to human judgment, and while human drivers learn to adjust to and compensate for common driverless car maneuvers. In another example of what could go wrong, Chuck Marohn from Strong Towns has pointed out that in congested areas, if jaywalking is allowed because the AV automatically stops when an impediment is detected, pedestrians will have an incentive to jaywalk whenever it feels easier than continuing to a crosswalk. Then the AV's speed and efficiency level goes way down. Considering these and many other possible complications, the often irrational fear of the public about the safety of autonomous vehicles, and general resistance to change, we see that the topic of driverless cars and city planning will continue to resonate for at least the next 30 years. For some ideas on policy-level planning documents that can be done right now, see the City of Boston policy and the City of Seattle playbook. Our final word on the subject centers on what we perceive to be the importance and primacy of envisioning the community you want before considering how you will adapt to autonomous vehicles. If you concentrate on how to make available technology serve the needs of the community first and foremost, instead of reacting to the technology as the dictator, you will do well. If you want an equitable, civic-minded, cost-efficient, and community-creating place to live, you can have it, regardless of where driverless vehicle technology and business models are leading. If you want complete streets because of their health and mental health benefits, AVs offer many possibilities for preserving and enhancing such a policy. But if you take a too passive "wait and see" approach, technology and major corporate players will leave your community fewer options. It's all up to you.